Welcome to Hillside Automotive Center Inc! Hillside Automotive Center Inc in Hartford, CT is a one-stop shop providing repairs and preventive maintenance on all vehicles – cars, medium and heavy duty trucks, imports, domestics, hybrids and diesels. We do our best to ensure your convenience, offering rides to and from work, school or home while your vehicle is being serviced. 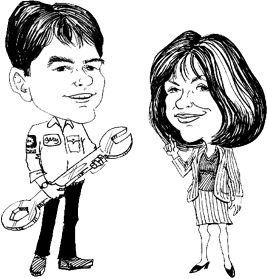 Most repairs are completed in one day, quickly getting you back to your normal routine. We are a AAA-Approved Auto Repair Facility and a NAPA AutoCare Center. When you come to us first you’ll find that we will save you both time and money. View Our Select Used Cars! Hillside Automotive Center Inc in Hartford, CT is a AAA-Approved Auto Repair Facility. All our services meet AAA’s stringent standards for quality repairs and customer service. As your local NAPA AutoCare Center, we stand behind our work with NAPA’s Peace of Mind Warranty. Parts and labor on qualifying repairs come with a 2 year/24,000 mile nationwide warranty. We also offer the NAPA EasyPay CarCareOne card. It lets you keep your car running safely and smoothly without tying up other credit cards. The NAPA EasyPay card gives you 6 months same as cash on purchases over $199, and extends your warranty to 3 years/36,000 miles for qualified purchases on your card. At Hillside Automotive Center Inc we treat you and your vehicle with the respect you deserve. We perform routine maintenance as well as major repairs. If you work in Hartford, we are conveniently located off Interstate 84. Drop off your vehicle in the morning. Vehicle scheduled maintenance services and any repairs are performed while you are working, minimizing your downtime. We will give you a ride to and from work. You can expect our ASE certified technicians to meet the highest standards in auto maintenance and repairs. We stand confidently behind all repairs with a 2 year/ 24,000 mile warranty. Give us a call today at 860-951-1083 to schedule your service appointment or you may schedule online today. Hillside Automotive Center Inc is a family owned business in Hartford, CT that takes pride in providing quality service for our clients while keeping their vehicles running well for years to come. We believe that professional and trustworthy auto repair expertise should always be coupled with an amazing service experience. Schedule your appointment today with the family to know to keep your car on the go!